When I was a teen, our house burnt down and we lost many prized possessions including my mother’s wedding dress, family photos, and the like. Since then, I’ve learned to keep a loose grip on most of my ‘stuff’. I take pleasure in our antiques and other cool collectibles, (at least I think they’re cool!) and I enjoy sifting through old letters from family and friends, or looking at drawings and cards lovingly handcrafted by my children. If something is especially precious, I take a picture and then store it somewhere online, but I try not to hang on too tightly to ‘things’. In recent years, we have been close to more than one threat from forest fires. I’ve asked myself, “What would I take if we had to evacuate?” I came up with only one item: a painting done by my mother that hangs in our home. 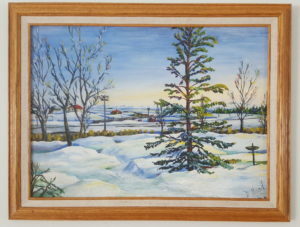 It was painted one winter from the view out the living room window. I was not yet born at the time, but my eldest brother was a baby, or so I’m told. My mother did a lot of paintings over the years and each one of her children have several, but for some reason this one has special significance in our family. We used a photo of it on the funeral brochure when she passed away. Perhaps it is so special because it reminds us of what a free spirited and creative person she was. She had an unorthodox way of responding to the world that our family has lovingly coined the ‘Doreen Method’. This means, if you don’t know how to do something, try anyway. If you don’t have a recipe or a pattern, make one up. (Or just make it up even if you do have a recipe or a pattern!) If something breaks or wears out, turn it into a piece of art. I was raised in an atmosphere where everyday was an opportunity to practice creativity. Mom suffered many hardships, too, but her response was always one of joyful submission to God’s will. That’s why I love the painting. It reminds me to live every day in using the ‘Doreen Method’. The Bible says we shouldn’t store up treasures on earth where moth and rust (and fire) can destroy. I try to take this to heart, but ‘the painting’ is the one thing I wish I could hang in my house in heaven. Maybe my mom is up there now, painting another one for just that purpose. This is reposted after appearing first on Pamela Thibodeaux’s blog on June 19, 2018. I can see its value to you.